Entering into the 3rd round of the 2010 Formula 1 schedule, the Red Bull Racing team has been snake-bitten by misfortunes. Plaguing Sebastian Vettel in the worst way, the German succumbed to mechanical problems on his Red Bull-Renault leading both the Bahrain Grand Prix and the Australian Grand Prix. As a preseason championship favourite in the 2010 Formula 1 drivers standings, the stumbling start resulting in the forfeiture of two potential victories leaves Vettel chasing the Ferrari duo of Fernando Alonso and Felipe Massa sitting in an early lead for the points championship. Red Bull Racing as a whole needed the Malaysian Grand Prix to turn around the team's overall poor showing last week in Australia. 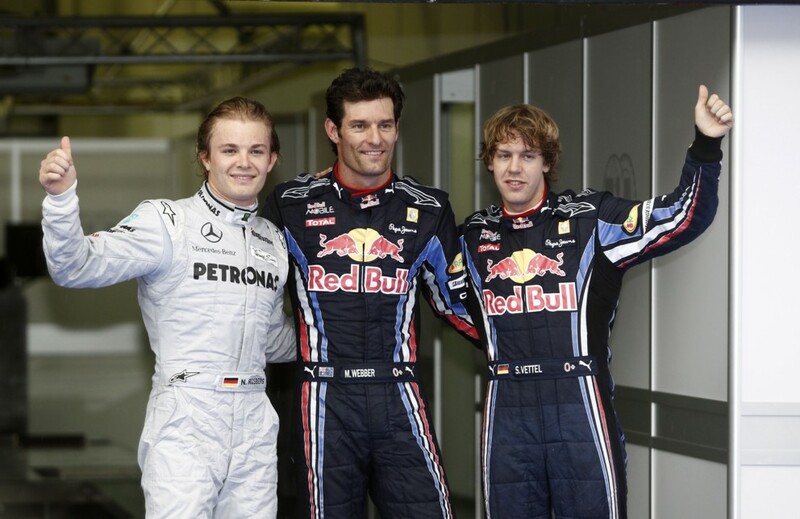 With qualifying proceeding the way of Red Bull Racing for the third time in the three races, Mark Webber was able to show the team's colours in the pole beating Mercedes GP's Nico Rosberg and teammate Sebastian Vettel for the position. Due to rain through qualifying, the time trial positions saw some surprises throughout the 2010 Malaysian Grand Prix starting grid as McLaren and Ferraris were to start deep in the field. As the field of 24 cars took their grid positions, the start lights expired to initiate the 56 lap contest on the Sepang circuit. With Formula 1 cars rushing up to speed, the Williams-Cosworth of Rubens Barrichello suffered a stall in his 7th place grid position requiring some evasive actions from cars starting back in the pack. Barrichello was eventually restarted and would finish 1 lap behind in 12th. With action in the back of the grid, the start saw Red Bull Racing's Sebastian Vettel launch like a lion through the frontstretch tailing his teammate Mark Webber. In a critical race-making move, Vettel was able to outpower Webber into turn 1 to take the lead. The Red Bull Racing Formula 1 cars would be a common sight in the top-2 spots in the race's running order. While rain was in the forecast, not a single drop of water fell on the Sepang track through the event leaving some longing for the same suspense of the race in Australian disappointed in that regard. However, the Malaysian Grand Prix did provide some exciting dry weather action. As promised, the Ferrari and the McLaren cars quickly gained positions. Providing the best show moving through the field was McLaren's Lewis Hamilton. Snaking by four cars before entering into the first corner, Hamilton continued to rage war on drivers including Renault's Vitaly Petrov. The bout between Hamilton and Petrov was the highlight of the early race action as positions swapped several times amongst the two runners. Showing bulletproof reliability through the first two races, the Ferrari team suffered their first mechanical problem of 2010 on the F2010 car of Fernando Alonso. Dealing with a gear selection issue most of the event, Alonso was fighting a temperamental problem through corning. 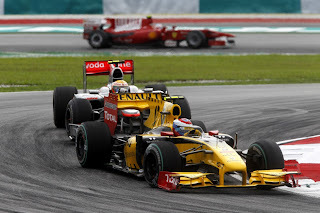 With 2 laps to go, Alonso's Ferrari was attempting to pass one of the McLaren-Mercedes cars when the shifting problem finally amounted to the first retirement of a Ferrari F2010 this season. Running like clockwork, the Red Bull Racing team celebrated their first 1-2 finish since the Abu Dhabi Grand Prix which concluded the last Formula 1 season. Sebastian Vettel led teammate Mark Webber across the start-finish line to secure has first 2010 Formula 1 victory. Showing considerable pace with the Mercedes GP team, Nico Rosberg was the best of the rest compared to the strength of the Red Bull Racing team at Malaysia. Finishing 3rd, Rosberg became the first driver since the 1955 Italian Grand Prix to ride a Mercedes engine/chassis to a podium in Formula 1. Rounding out the top-5 of the 2010 Malaysian Grand Prix is a Renault and a Force India formula 1 car. Robert Kubica's 4th place run comes after a podium finish last race while Adrian Sutil was able to back up his qualifying effort after 56 laps with 5th. In the final two top-10 spots, drivers Jaime Alguersuari in the STR-Ferrari and Nico Hulkenberg with a Williams-Cosworth gained their first career Formula 1 points. Finishing outside of the points, the best of the new for 2010 teams at Malaysia was the HRT-Cosworths driven by Karun Chandrok and Bruno Senna. They pair finished 15th and 16th on the event still running at the end. Despite the rough outing for Alonso and a 7th place for Ferrari's Felipe Massa, they continue to hold the top spots in the 2010 Formula 1 points after 3 races. However, thanks to the victory in Malaysia, Vettel is tied with Alonso for second place in the standings heading into the next grand prix round in China.